Tonight I tackled two small blocks with a color layer, the first time I’ve used anything but black ink in a loooooong time. 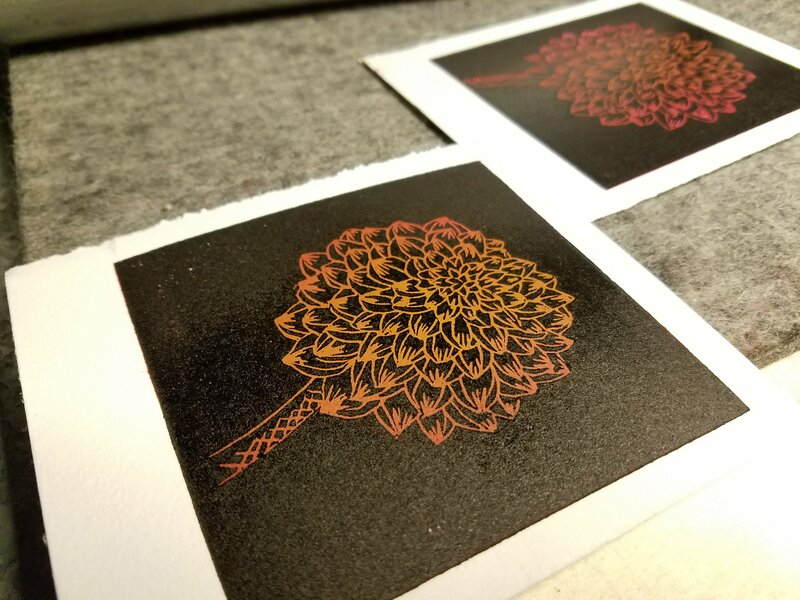 These were modeled after the burgundy dahlias in my wedding bouquet, my favorite flowers. 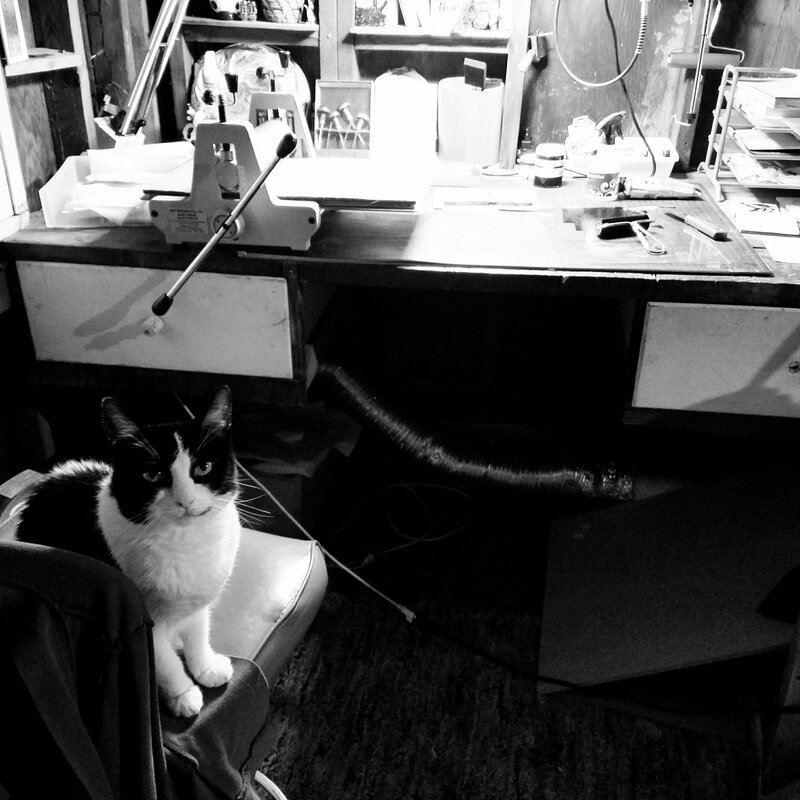 My trusty studio cat supervised the process. 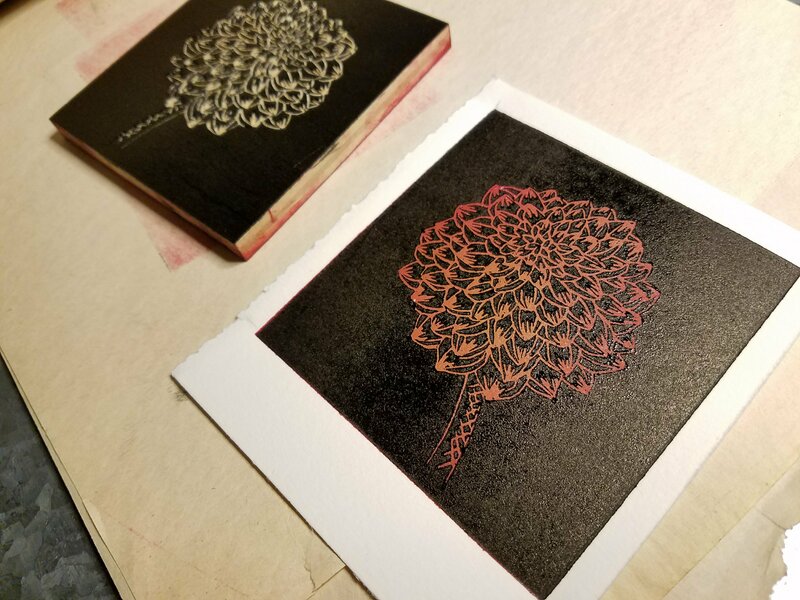 A few days ago I made a post about my collection of vintage printing blocks, with a teaser about a new project I used them for. It’s probably pretty self-explanatory–I used them as embroidery patterns. 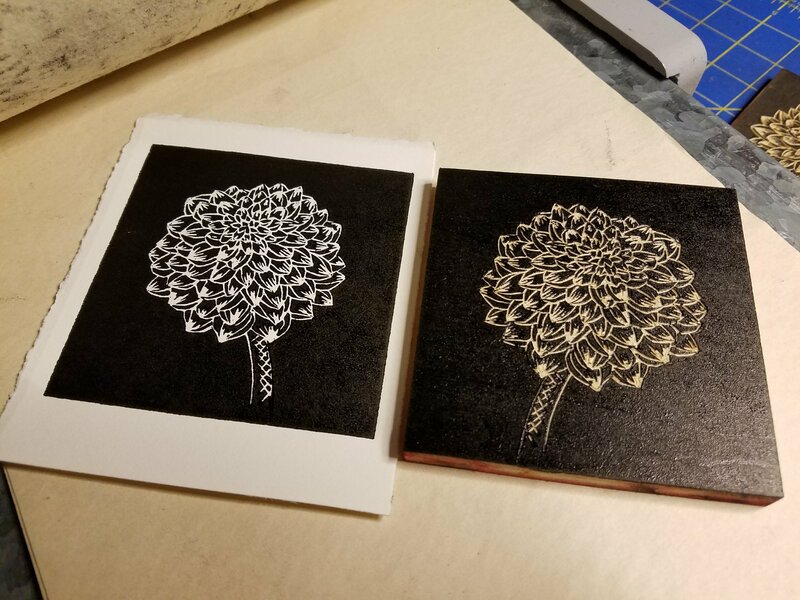 By taking them through my Challenge proof press with carbon paper, I printed them on unbleached linen, then embroidered the images. 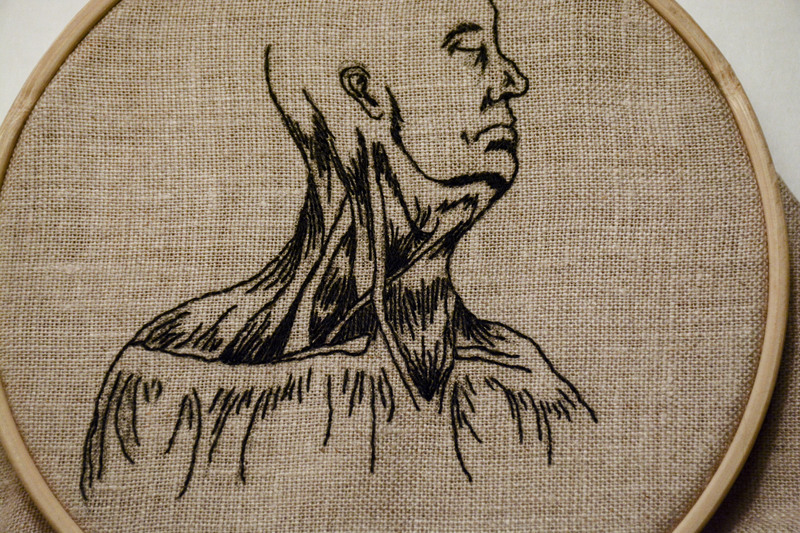 Printmaking and embroidery are two mediums I don’t often get to combine. Somehow using antique printing blocks as a base for a similarly antiquated medium like embroidery seems kind of right. These are each in either 3″ or 5″ hoops. And right now, they’re all available for sale at the Corvallis Art Center’s Art Shop! On the shelf above my workbench there’s a box. 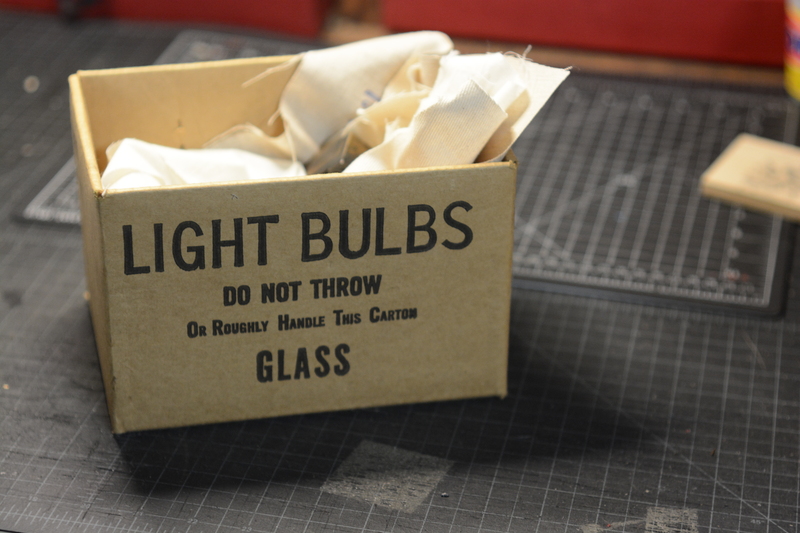 That box contains my collection of type cuts–also known as printing blocks, or letterpress cuts. They’re images etched into wood or lead, meant to be printed alongside letterpress type. This one is a simplified line etching of a traditional platen press–the kind of printing press used for traditional letterpress printing. As a Pacific Northwest native, I do love trees. By far my strangest cut is this one–it’s about 3″ across, and was presumably used for creating dental records. Can you even imagine something as mundane as dental records being hand printed? But this one is my favorite. Surrounded by intricate images of elk and horses and trees and other oddities, this pointing hand is the jewel of my collection. It looks like metal but it’s not–this is my only wood etched type cut, carved from a single piece of wood rather than from lead (or lead mounted on a wood base). The hand itself is probably recognizable–this design, called a manicule, has become popular in modern graphic design. They were originally used to draw attention to important text in documents and books dating back to the 12th century, a common form of marginalia on some of the earliest letterpress printed materials. Given its history and delicate line quality, it’s hard not to love. I mean look at the individual carved lines–so much information in such sparse, elegant detail. This is what you think of when you think traditional woodcut design. In the spirit of my New Year’s resolution, I finally finished the muscle study I started way back in October. 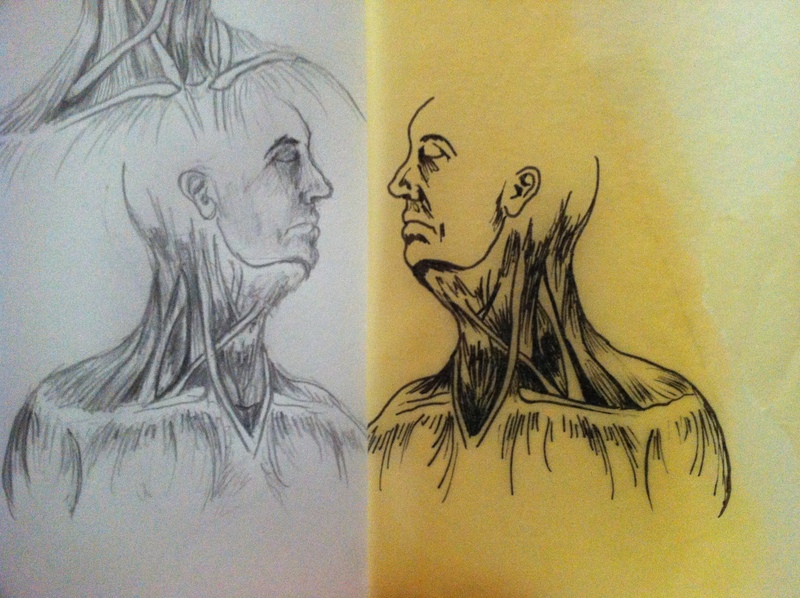 The original sketch for this stemmed from some neck issues I’d been having, which got me thinking in terms of muscles–a departure from my usual focus on skeletal structure, but just as interesting. I’m still trying to decide how this will be displayed–either in the hoop, as shown here, or stretched around a wooden frame. I’ve been both praised and criticized for showing embroidery in the hoop. Personally I don’t think there’s a problem with displaying it in a way that reflects the utilitarian tradition of the medium. That’s half the reason I do it: to connect the artwork to its roots. 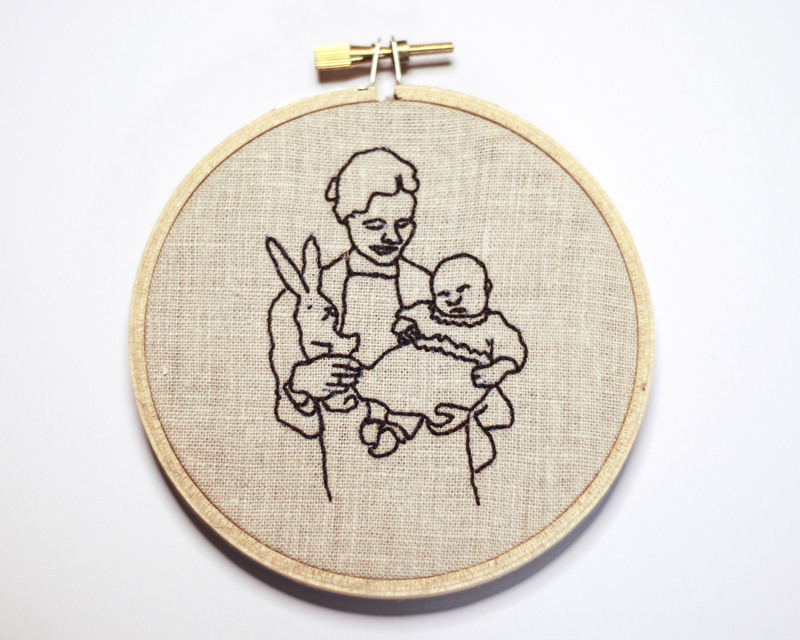 An embroidery hoop is a simple, elegant item, rife with history, and used in the right context, it can add another layer of meaning to the work it holds. Why shy away from that? Love it or hate it, you have to admit that it’s visually striking to see a piece hanging like this: the raw edge of the fabric, the wrinkles, the shape of the whole thing. I’ll probably clean this up a bit before it’s shown anywhere, but if I’m being perfectly honest, I prefer it this way, loose threads and all. What about you, fellow embroiderers? How do you hang your work? In retrospect, 2014 was not my most prolific year. What little work I did turn out was some of my best — my skull studies, Pacific Northwest alphabet book, and various other small projects. I was even lucky enough to be featured in Mixed Media Art Magazine. But full time employment leaves little time for personal projects, and this year my creative efforts flagged considerably in favor of lazier and less fulfilling pursuits. I imagine I’m not the first person to fall victim to creative malaise, but that’s no excuse. I’m planning for 2015 to be better. 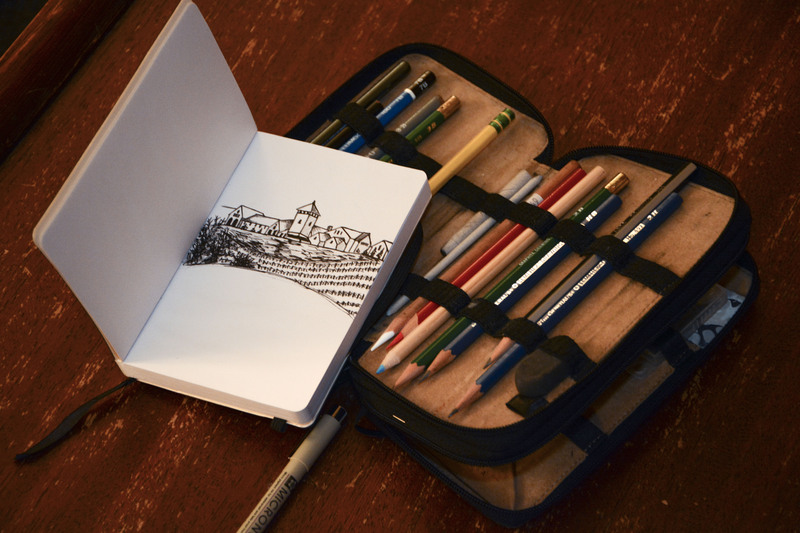 I’ve got some vague project ideas, some even vaguer goals, and bunch of sharpened pencils, so I’m good to go. Here’s to a fresh year. 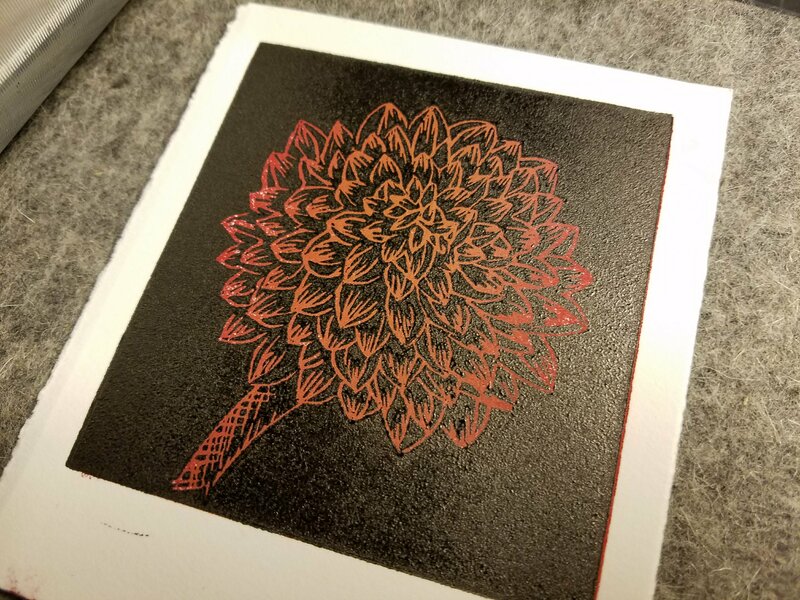 Unfortunately my giant mountain woodcut is on hold right now, because my neck is sort of jacked up and sore and I’m a huge sissy who doesn’t feel like coming home from work and carving. So while I wait for my next chiropractor appointment I’ve started a new project that doesn’t require quite so much physical effort. 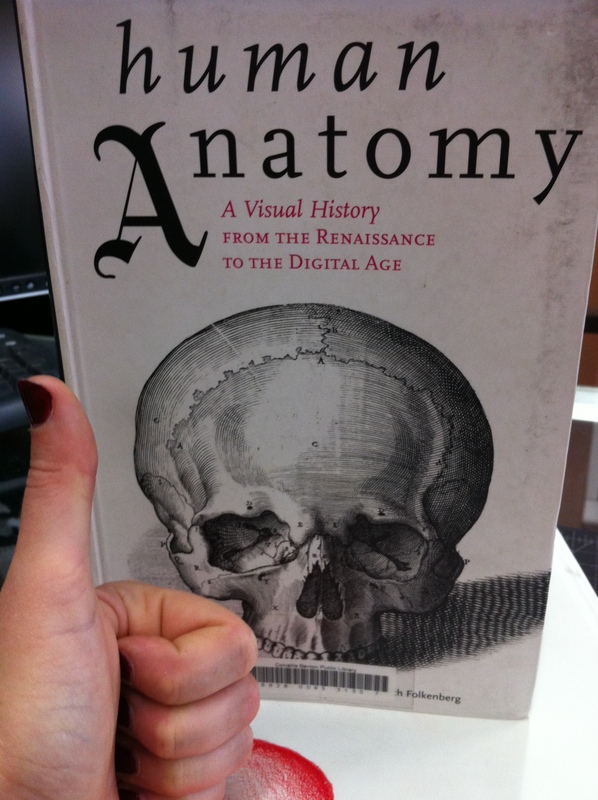 This week I discovered the library’s medical anatomy section–I spent most of Sunday sketching from a pocket version of Gray’s Anatomy and my own copy of Human Anatomy: A Visual History from the Renaissance to the Digital Age. Awesome book. 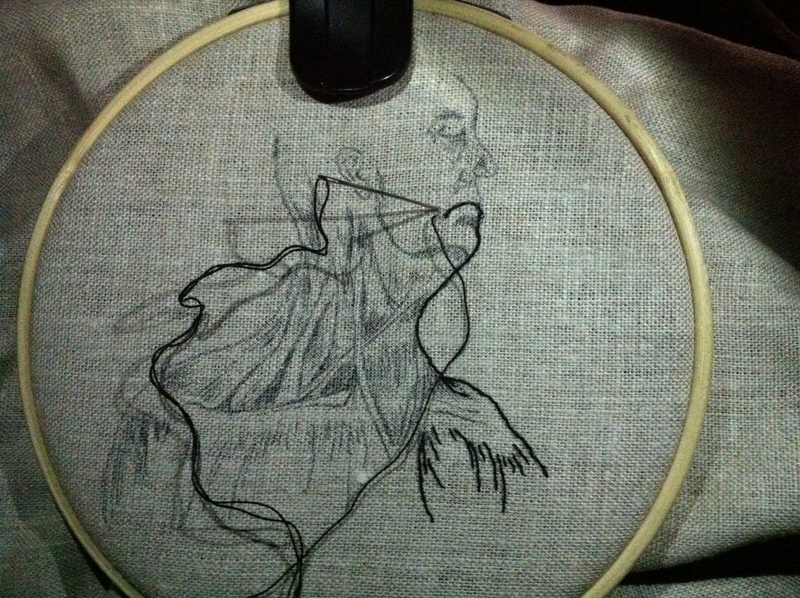 My intent is to embroider this sketch first in black, then to lay in some color in the most dense areas of muscle. Usually muscular anatomy doesn’t interest me as much as skeletal–bones are just so more more solid and strong, where muscles flex and lack a lot of definition. 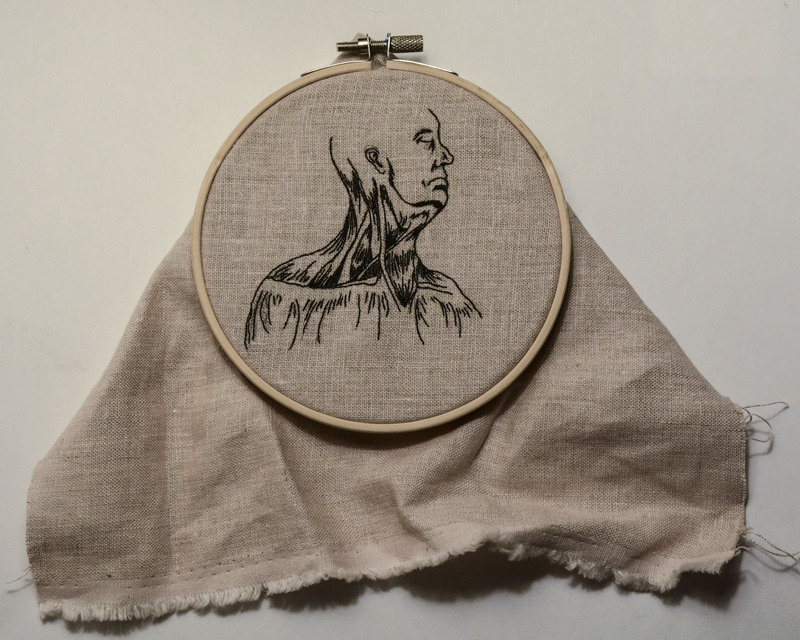 But the issues I’ve been having with my neck and back have made me more interested in the way muscles fit together and work, which is what prompted this project. My usual embroidery setup has a new component, this awesome clip on light I bought from work. It’s meant for a music stand, with two flexible lights, one for each side. It’s absolutely amazing for embroidery–the two lights can be positioned to fully light whatever I’m working on, which is invaluable given that I usually sew in my dimly lit living room. 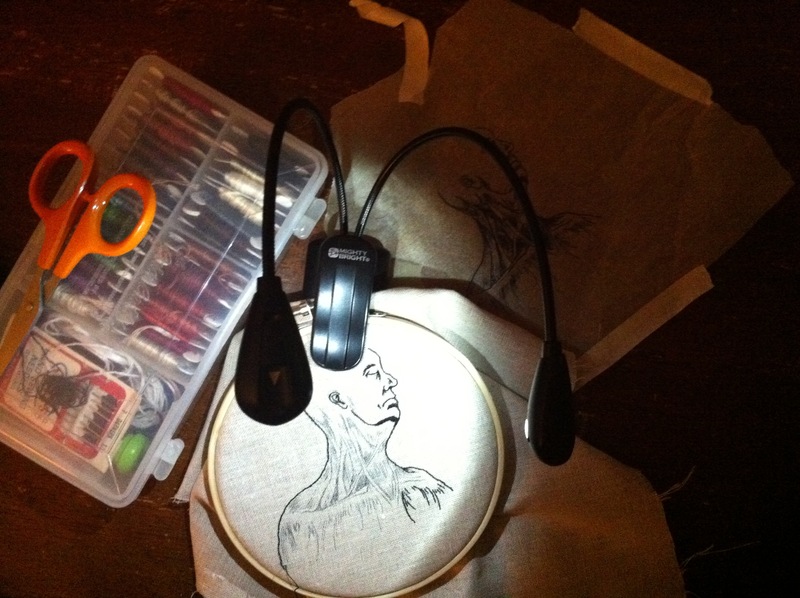 Anyone who sews or cross stitches should consider getting a light like this–Mighty Bright Duet2 LED Music Light.